With the garden produce in full swing, there is nothing like picking your own fruit and veg. Now, I'm going to have to admit that I can't really take all the credit for the fruit and vegetables in the garden. My husband is the one who lovingly planted the seeds and did all the potting on, my job was to make sure that everything was well fed, watered and happy. The results of which are healthy, nutritious, organic delights. When I noticed that Andrea from Andrea's Recipes was hosting an event entitled 'Grow Your Own', I knew I was going to have a fight on my hands. My veggies started to throw themselves at me as I tried to make up my mind what to select. In the end, I picked a cucumber - we had just had a day trip to France and some soft cheese that I had bought would be the perfect accompaniment. The result was crisp, cool little nibbles, perfect for a warm summer evening. 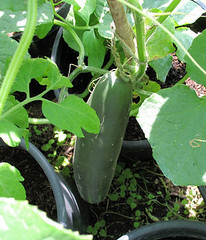 Amounts are approximate because it depends on the size of the cucumber. I used Boursin cheese, but you can use any cream cheese - one with herbs would be good. 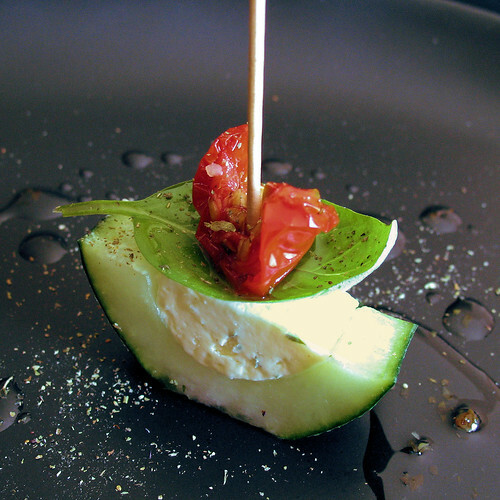 Cut the cucumber in half length-ways and slice a little off the bottom to make it sit flat on the plate. 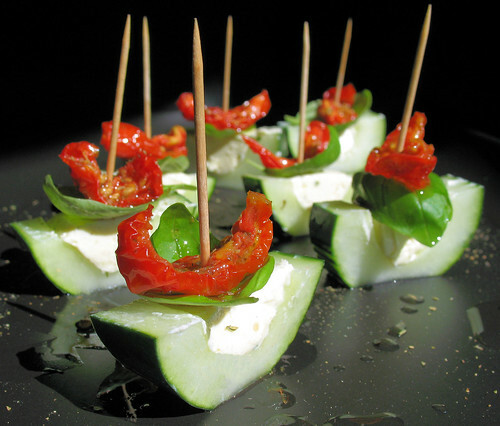 Fill the hollow of the cucumber with the Boursin/cream cheese, smooth top with a knife. 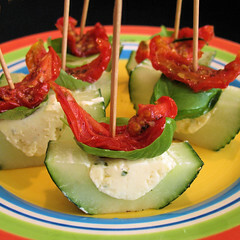 Cut the cucumber into bite sized pieces and top each one with a basil leaf and a tomato. Secure with a cocktail stick. Drizzle with some of the olive oil from the tomatoes. I love this idea, they look so fresh and delicious! Thanks for participating in Grow Your Own. Another amazing photo and I love Boursin, although I get complaints, if I go or the garlic one! They look wonderful Nic, I will try these soon, as I love Boursin. Nicisme, your photos are breathtaking! This is some beautiful and delicious food, I have to say! You are so creative with food that I just don't know what to say anymore. Bravo. What a creative and colourful appetizer!!!! Beautiful photographs as well. I am glad I have discovered your site. Delicous looking picture Nic! You've cracked it yet again! Good simple and delicious food! Congrats! Thank you everyone for the lovely comments, you have made my day! As for the photos, I really daren't tell you how many I had to take to get a decent one.... LOL! Those are some excellent appetizers! Beautiful pictures. I love produce in summer. It's hot out but the squash, zucchini, tomatoes can't be beat! I'm going to "show off" and make this tomorrow to take for a family gathering. So simple and yet so elegant. Thank you. Brilynn - gardening is not my favourite thing to do given a choice! Noah - we haven't had much luck with our zucchini this year, maybe it will make a late spurt in the next few weeks! Pam - hope you enjoy them! Cate and Evoexplorer - thank you for your nice comments! what a great idea! i am going to do that for our next family gathering. Jeanne - Boursin is a great cheese! Melissa - Hope you enjoy them.